The US 10-year bond has dropped by 8 bps today and has slammed through what was looking like support around the 2.50% level. If it closes at current levels than this will be the lowest close since 6/20/13. The 30-10 spread has widened by 7 bps during May, however, it is still down YTD. 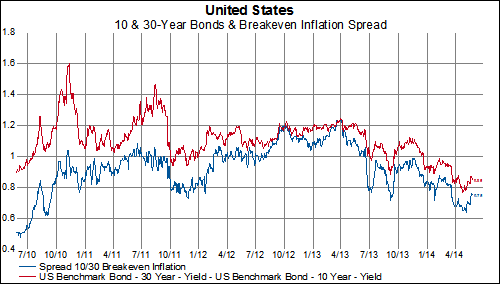 Same goes for 30-10 breakeven inflation spread. 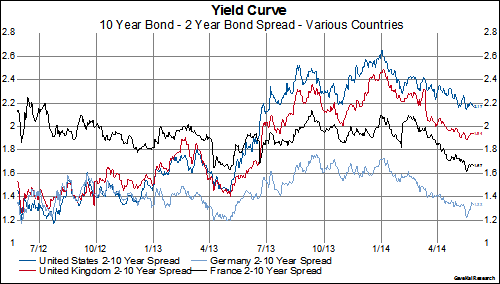 The front end of the yield curve (10-2 spread) has been narrowing all year as well and not just in the US. 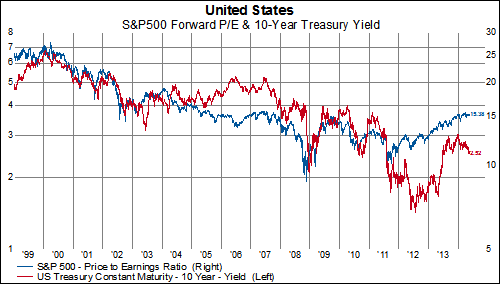 A falling 10-year yield hasn’t been the greatest sign for forward P/E ratios. However, since the end of 2011 this relationship has broken down somewhat.